Hokitika – Snapper caught on beach longline near Hokitika, West Coast, S.I. Pictured: John and Eli holding 13, 15, and 17 lb. snapper. 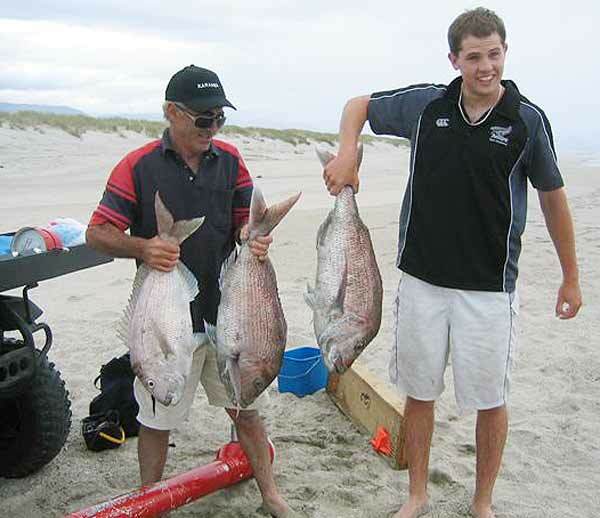 Snapper fishing for 2007 has been excellent for John and Jean Brewer of Hokitika. A total of 30 snapper weighing from 4lb. to 17lb. (16 in December) and many gurnard were caught on their favourite West Coast beach north of Hokitika. The light winds and clear calm seas made December fishing exceptional. Most of these fish were caught on an electric Kontiki but rod fishing was very good as well at times. The Hokitika River is a very popular place for whitebaiting. It can get very crowded at times especially when the bait is running. On the West Coast, the whitebait season runs from 1 September until 14 November. There’s is also very good surfcasting from the beaches near Hokitika provided there isn’t too much swell and the sea is clear. In fact, there is very good fishing all along this coast though much of it is difficult to access without a long walk. Often the best fishing is during the wintertime when there is a greater chance of calm conditions. During winter I have caught red cod, kahawai and elephant fish. During the colder months, it isn’t unusual to experience cold frosty mornings followed by clear blue skies and little wind. Strangely the frost doesn’t affect the sand flies which come to life at the beach around 10:00 in the morning during the winter! Don’t even think about going surfcasting on the West Coast without heaps of sand fly projection. During the summertime, they can be large schools of kahawai all along the West Coast. Summer is also the best time to target snapper and rig sharks. Good numbers of gurnard are also taken from the beach when conditions are favourable. 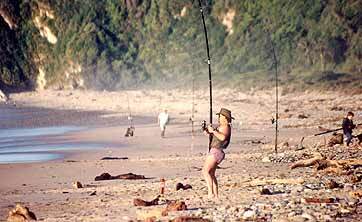 In my experience surfcasting is generally more productive on the South Island’s West Coast than on the East Coast where there are more fish and a greater range of species. Sea-run brown trout will often be found near the mouths of West Coast rivers; especially in the spring when they hunt whitebait and silveries.